The Mossberg FLEX 500 is one of the three current versions of the popular Mossberg 500 pump action shotgun series. The Mossberg FLEX 500 features a TLS Locking system that does not even require any tools to use. This locking system allows the shooter to quickly switch their recoil pads, forends, and stocks without much hassle. The core component of the shotgun is the receiver. Everything else can be reconfigured or upgraded if you simply know how to do it. A lot of people like to switch around the barrels, recoil pads, forends and buttstocks with higher-quality ones than the OEM versions that come with the weapon. With the right mixing and matching of parts, you can convert your Mossberg FLEX 500 shotgun into a weapon that is suitable for home defense, hunting, bird shooting, or law enforcement use. As for the barrels, you have numerous choices for your weapon as they pertain to chokes, sights, and lengths. All FLEX TLS components can be removed and mounted onto the FLEX 500 shotgun within just a few seconds, and you don’t even need any tools either. This is an important point because a lot of other modular shotguns require you to use tools, but not the FLEX 500. 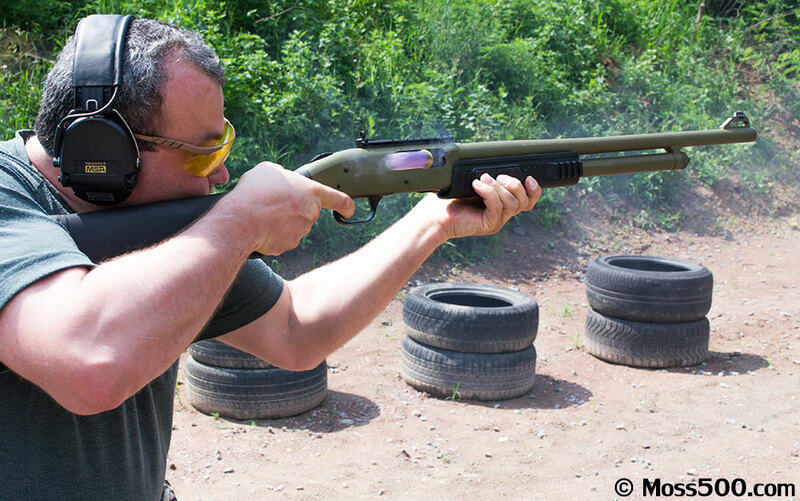 It is an easy to use all-purpose shotgun that can be converted into just about anything. However, you may like the barrel that comes with the shotgun because it is a ported barrel that is vent-ribbed and has twin bead and three Accu-Set choke tubes that screw in. The buttstock that comes with the FLEX 500 is made of a synthetic texture and contains a stout recoil pad which is meant to reduce the recoil that is caused after firing the weapon. Other parts of the weapon include dual extractors, dual action bars, a big steel locking lug, and an anti-jam shell elevator. Best of all, left handed and right handed shooters can easily have access to the Mossberg safety button that is mounted on the top of the weapon. This kind of versatility allows shooters to survive any shooting situation. If you are interested in purchasing the Mossberg FLEX 500, you can find them priced anywhere between $400 and $470. There are a few different versions of the FLEX 500 such as the FLEX 500 Tactical and the FLEX 500 All-Purpose Pump-Action Shotgun. Since both weapons can be customized, it really doesn’t matter which one you purchase right off the bat. Both are great weapons and allow for great versatility.